Review: Superb studying and preparation. Perfect to score you FAA exams!!!! Review: Very good product , ASA always meets the FAA requirements needed to pass your exams. Very clear expanations and easy to use. Great product and well worth the money! Review: On my private written exam for helicopters I got a 97% after only using this program as a study guide. It also is a great refresher, sure it doesn't include paragraph explanations, but 9 out of 10 explanations are very good. Review: I love it. It has been helping me study for my commercial ground school and I think everyone should own it working on their commercial license. Review: This product was purchased for our daughter who is in a commerical pilot program. She is using it as a study aid. As the school she attends just switched to this program. Review: Type O's, the explantions are confusing at times. But overall its good if you weed through the "bs". Review: If this was created a long time ago, I get it. But it feels very much a "good enough" effort. The main window can't be re-sized, which means scrolling up and down on long tables to try to see all the information needed to answer a question... hard when it's late and you're tired. And the figures also can't be blown up, so you have to struggle to see charts and graphs. The explanations are occasionally wrong and almost always too brief. On the whole, it gets the job done, but in a minimal way. Q: Will ASA provide an acceptable certificate so I can take the Commercial Knowledge Test at the end of the course? A: Yes, you can choose to print or email your results to your instructor or to ASA to obtain an endorsement to take the FAA test. 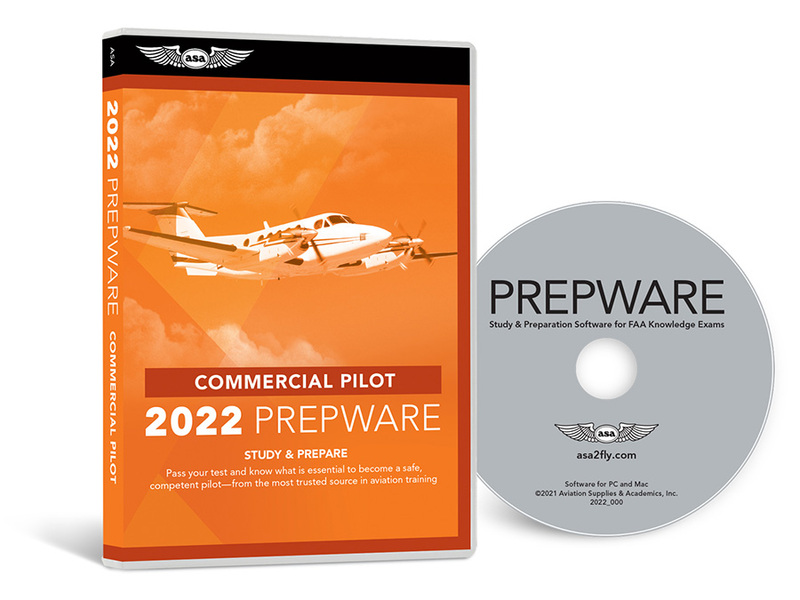 Q: Is this Prepware good for a commercial helicopter pilot written test as well? A: Yes, the ASA Commercial PrepWare covers airplane, rotorcraft, glider, lighter-than-air, powered parachute, and weight-shift control. Includes book and software for Commercial airplane, helicopter, gyroplane, glider, free balloon and airship tests.